Messier 106 (M106) is a spiral galaxy located in the constellation Canes Venatici, the Hunting Dogs. 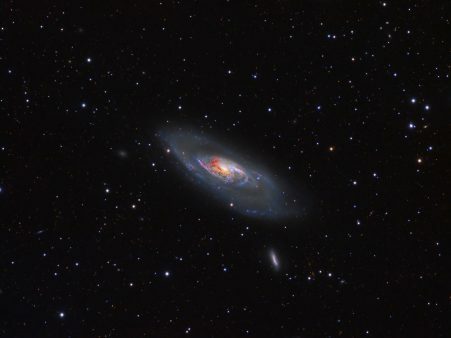 M106 lies at a distance of 23.7 million light years from Earth. It is similar in size and luminosity to the Andromeda Galaxy (M31) and is one of the brightest, largest nearby galaxies. M106 Galaxy is dominated by blue spiral arms and red dust lanes near the nucleus, as shown in the featured image.